It is makeover time! Yup, I got another little furniture makeover under my belt. 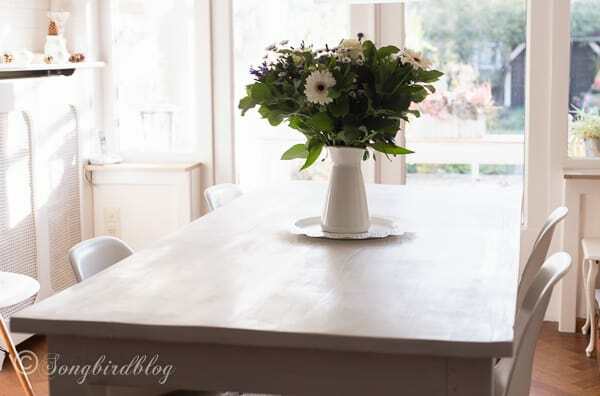 Our farmhouse table got a makeover with milk paint, and she is looking good. I guess the man was happy about the result too. 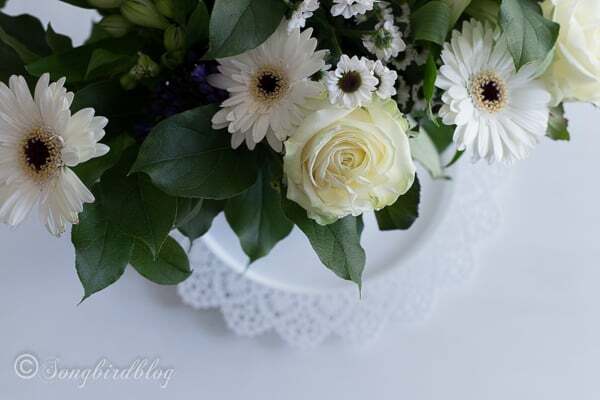 He bought me some flowers to celebrate and so “I could use them for the photos for the blog”. Ah, he gets, me! What a man, I think I’ll keep him. The new color makes all the difference in the world. And it didn’t even take that many steps to get her there. See how that yellow wood, just clashed. Now my ‘new’ old table and my hutch make harmony together. The project took a couple of days working on and off, but it went pretty straight forward. I took the table outside and gave her a proper sanding. I sanded the top until the bare wood, and the legs until they were truly and well roughed up. For the table top I used — in order— the band sander, the heavy duty elliptical sander, the small elliptical sander and finally the triangle sander for the difficult corners. For the legs I skipped the band sander because it is too heavy for me to use on vertical surfaces. I started with 60 grid paper and worked my way up to 240 grid. Of course with all that sawdust flying around, I protected myself with a mask and glasses. In the end it took a couple of hours of dedicated work and then she was ready for the next step. Time for some milk paint action! I really wanted a farmhouse table look, so I knew that any modern paint just wouldn’t do. So I opted for Miss Mustard Seed Milk Paint. I sanded her so hard because I didn’t really want any major chipping action and milk paint adheres to raw wood like a dream. After my mixing wows, when I painted the hutch, I decided to go straight for the immersion blender. Good thinking, it made mixing the paint up really easy. I gave her several coats of paint. Can’t even remember how many. Milk paint dries so fast that you can almost do layers in one smooth circle. If you start with the top, that will just about be ready for a new layer once your legs are finished. But I did sand in between layers. Just a light sanding with a fine grain paper. The water in the paint made the fibers in the raw wood stand up, so I smoothed them down by sanding. After that it was a matter of waxing. I used the proper wax brush for a change. What a difference! I’ve only used the sock method before, but I must say that wax brush makes the job so much easier. I got all my supplies for the milk paint at my favorite local european milk paint stockist Old Red Barn. I did some minimal distressing. Just enough to make any additional real-life distressing look okay and welcomed. We’ll see how she holds up. This table is a hard working table. It is where we read the newspaper, arrange flowers, eat breakfast, have dinner parties, get busy crafting, dump our stuff when we get in etc. It is the central hot spot in our home and she is seldom empty. I like how the slight grey on my hutch (It is the color Grain Sack) and the white of the table (I used Ironstone) talk to each other. I am sure it is a quiet and sophisticated conversation between the two. They make a nice matching couple now, different but the same. Yeah, and everything looks so good on this fresh, crisp new surface. Like my white flowers. Love it! So happy I got to strike this of my list. And do you like my ‘new’ farmhouse table? Are you surprised I went with white? (hihi me neither). 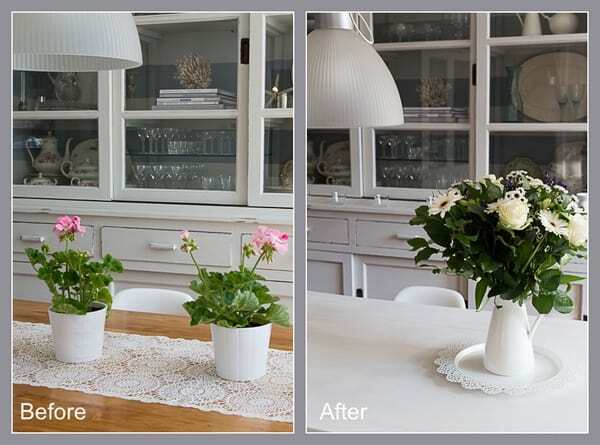 Could you handle a white table in your home? I just finished painting an antique sideboard with MMS grainsack, a lovely white/gray color. It is actually funny seeing this post, cause I am just about to change the top of our old farmhouse kitchen table allso! And I would like to use this exact color! Just hoping it will look as super as yours! Much better than the yellow. I’m a timber lover and find it really hard to paint over beautiful timber, in fact I can’t, but yellow wood … YES! You must be so happy with the result. Calm, tranquil, beautiful. I’ve learned tips from you in this post about MMSchalkpaint. Tour table does look totally new. Not even like the same piece of furniture!! Glad for the sanding tips and why you sand between coats. You know what?? Being off by only a year is not bad at all. Proud you did it!!! Thank you! Hmm, seeing that it is November already I’d say I am just about two years off. But heck, at least it got done and I couldn’t be happier with it. Glad you found my little MissMustardSeed Milk Paint tips useful. Take care of yourself sweet Gwen! !